Inez asks "Miss Bessie" to send a list of names Mr. Cutting recommended for Berry Trustees. 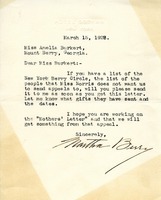 Bonner writes that Berry is "pretty well and has been lovely all the time." She describes a dinner event, her health, and the weather. 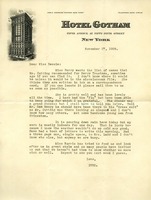 On Hotel Gotham stationery.